Short story collections often give readers a taste of a writer’s style, preoccupations, and a sense of whether the reader will enjoy an author’s longer works of fiction. 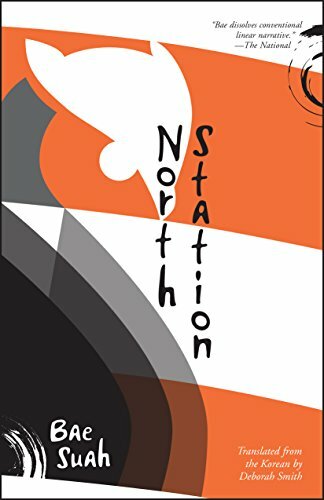 After English translations of two novellas (Nowhere to be Found, 2015 and A Greater Music, 2016, the latter reviewed in NYJB) and a full length novel (Recitation, 2017, also reviewed in NYJB) the seven stories in Bae’ Suah’s North Station are less narrative and every bit as challenging as her longer works, perhaps even more so. One way to view these stories is as philosophical essays in fictional form that address some of the same philosophical, psychological, spiritual, aesthetic, cultural, and societal topics and concerns that are found in Bae’s longer fiction. But by devoting each story to only two or three of those topics and freed from a longer work’s overarching narrative the stories address those issues in even greater depth and convey them with poetic prose of comparable beauty to that found in her previous books in English translation. Compared to them this book has an even higher degree of difficulty—with abrupt linguistic changes in voice, number, and/or gender and multiple starting, stopping, and resuming narrative threads—that demand highly focused concentration but like them reward rereading. At just over 200 pages North Station is longer than Bae’s novellas and shorter than Recitation. The first six of the seven stories are between 23 and 28 pages each, while at 45 pages the final story “How Can One Day Be Different from the Rest?” is almost double that. The first and last stories employ third-person narration and the middle five have first-person narrators. As in A Greater Music and Recitation translator Deborah Smith’s English is stunning. “In dreams, looking into the mirror is a hair-raising experience. The empty black holes looking back at you, so threateningly strange and ravenous. A river flows in bed, and on its bank stands a single tree. Its branches stretch out horizontally, and your wrist-watch hangs from one of them, ticking. It will go on telling the time when we have disappeared from the earth. We, now lying down, black-and-white bodies delving deeply into each other. Until we eventually transform into fossilized tree scarabs, with only our shells remaining. The story’s title refers to an owl the narrator photographs. The theme of mortality is further developed in “The Non-Being of the Owl,” whose title refers to three trees where owls used to perch that have been cut down and to which they will never return. The narrator is a Korean writer living in Germany named “Ms. Bae Suah” who refers to dear friends living in various German cities. In between the two owl stories the title story explores the theme of parting from someone who is still alive. In it a couple at a train station wish they could stop time to delay their parting, after which the recollection of the parting is compared to a ghost. Throughout the book imagined recollections supersede actual events. Toward the end of the story the narrator asserts, “there is no reason to resist pain or unfreedom as these are the very things that make us dream most wonderfully.” That sounds like the stance of some artists and intellectuals in undemocratic countries, in particular Imperial and Nazi Germany, who rationalized that the inability to participate in public political life leads to richer inner lives. The penultimate story, “Dignified Kiss of Paris Streets,” returns to the theme of a person’s visual image that “First Sight, First Snow” introduced but this time as a component of the female first person narrator’s personal identity. Questioning a central character’s identity is also reminiscent of Recitation. This story’s narrator’s identity is called into question first when a street performer tries to recruit her to join his act “dressed up as a Mandarin coolie” and again when she receives an official letter that is clearly intended for someone else instructing the recipient to apply for a new identity card. She discusses these distressing developments with a photographer named Mao whom she earlier compared to his mass murderer namesake. The title of the story is also the title Mao gave to a photograph of her respiratory system. All of the first six stories’ themes and topics are touched on in the final and longest story, “How Can One Day Be Different from the Rest.” The protagonist Mrs. Kim is a playwright whose play calls for a set with a hundred rooms visible to the audience and nearly as many actors. A disagreement between the actors and the director leads to the production’s cancelation shortly before opening night. That disappointment leads Mrs. Kim like the protagonist in Recitation to give up the theater and her native Korea for a life of foreign travel, but unlike Recitation’s Kyung-hee who is drawn to Europe Mrs. Kim chooses to tour China, the venue of her honeymoon years earlier. To do justice to this story requires more space than remains in this review; suffice to say fans of Bae’s fiction won’t be disappointed and readers who enjoy Jorge Luis Borges, W. G. Sebald, and other difficult post-modern fiction writers but have yet to read Bae Suah are in for a treat.